Coffee drinks at the press of a button. 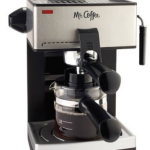 The Gourmia GCM 6500 is a full-featured espresso maker. Designed to make both espresso and lungo, an espresso-based beverage made with more water for a milder flavor, the Gourmia offers high quality coffee drinks at a relatively affordable price point. Rather than relying upon ground espresso, the Gourmia 6500 uses easy-to-use Nespresso pods; however, you can also use a refillable Nespresso-compatible pod. Nespresso capsules are available in a range of flavors, enabling you to create many different drinks at home. Many of the features of the Gourmia 6500 are fully automated, making it simple to fix a delicious coffee drink in your own kitchen. The Gourmia 6500 has a sleek and polished appearance, with a relatively square appearance. The finish is high-quality black plastic with stainless steel details. The milk receptacle is made of clear plastic, eliminating any risk of forgotten milk. It’s fairly compact and will fit well in most kitchens, even if it needs to sit under upper cupboards. If you’re ready to skip the morning Starbucks, the Gourmia 6500 makes it simple to make your fancy coffee drink at home. Insert a Nespresso pod, make sure you’ve got water in the reservoir and push a single button to produce your coffee drink. 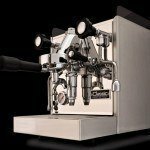 The Gourmia 6500 has three buttons, one for espresso and lungo, one for cappuccino and one for lattes. 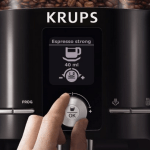 You’ll push the espresso button once for an espresso and twice for a lungo; you can also opt to create a custom brew by holding down the espresso button. For a cappuccino or latte, simply fill the milk tank, add your Nespresso pod, and press the cappuccino or latte button. For convenience, the milk tank can be removed and stored in your refrigerator. Maintenance of the Gourmia 6500 is relatively easy; the milk tank is removable for washing, and directions are given for an express cleaning of the frothing device. The milk frother should be thoroughly cleaned monthly by disassembling and washing by hand or in the dishwasher. The Gourmia 6500 holds used pods; these should be removed regularly; however, it can contain up to 12 used Nespresso-style pods. The used capsule container may be removed and handwashed, as can the water tank. Clean the inner workings of the machine by running a full tank of water through on the Brew cycle without a coffee pod in place. Ease of use is the highpoint of this little espresso machine; it offers both espresso and milk-based coffee drinks at the push of a button. There’s no learning curve to prepping a latte or cappuccino, and the machine brews your coffee quickly. Cleanup is simple, and this is a workday-friendly coffee maker, and a good one for people looking for a low-effort coffee option. If you’re a coffee snob, the Nespresso pod-based Gourmia 6500 may not cut it. While you can fill a refillable Nespresso pod, you may want more customization options than the Gourmia offers, and will likely be happier with a manual, rather than automated espresso maker. 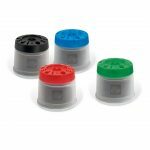 Illy IperEspresso Capsules Review – How do they stack up? worst machine . 3 months after i bought the frother completely quit. 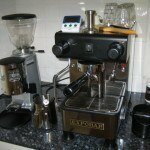 Now i can make only espresso. Before this i bought Gourmia 5500 for my vacation home and hardly used 6 weeks in 2017. This machine espresso quit but frother working. I will never buy from this company again.